Junior guard Kealen Washington-Ives matched his career high with 15 points in the 110-101 victory over Iona on Feb. 25, connecting three times from three-point range. 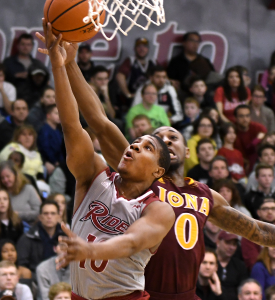 The men’s basketball team secured a share of the MAAC regular-season title and the No. 1 seed in the conference tournament after scoring a season-high 110 points in its victory over Iona. Entering the matchup with Iona on Feb. 25, Rider was tied atop the MAAC with Canisius, but owned the tiebreaker for first place. The Broncs and Golden Griffins both took the court for their final regular-season games at 2 p.m., with the top seed in the conference tournament on the line. Rider got the sellout crowd going early, starting the game off on a 10-3 run and forcing an early timeout by the opponent. Sophomore forward Tyere Marshall was unstoppable in the game’s opening minutes, scoring eight of the Broncs’ first 14 points. Marshall was joined by junior guards Anthony Durham and Kealen Washington-Ives and freshman forward Dimencio Vaughn in creating the scoring for Rider in the first half. Marshall, Durham, Washington-Ives and Vaughn combined for 47 of the Broncs’ 57 first-half points. After a steal by Rider, sophomore guard Stevie Jordan threw an alley-oop off the backboard to Durham who slammed the ball down, giving Rider a 22-10 lead and bringing the crowd to its feet. Jordan was in foul trouble throughout the game and was forced to sit for major parts of the first half. Stepping up to fill his role was Washington-Ives who put on a clinic in the first half, scoring 15 points on 6-for-8 shooting, including hitting three times from beyond the arc. Rider held a double-digit lead for most of the first stanza as Iona attempted to claw its way back into the game. At the close of the first half, Washington-Ives dribbled away the final few seconds, while sizing up his defender, before hitting a step-back three-pointer as the buzzer sounded. The Broncs’ bench swarmed Washington-Ives then headed to the locker room, leading 57-40. The beginning of the second half was much of the same for Rider, continuing to get easy points in the paint. Marshall recorded his team-leading seventh double-double of the season within the first five minute of the half. Marshall finished the game with 19 points and 16 rebounds. Vaughn scored 12 of his team-high 26 points in the second, pushing the Rider advantage to 26, its highest of the game with 8:50 remaining. After two flagrant fouls on the Broncs against Vaughn and Marshall, the Gaels started to wither away Rider’s lead. Vaughn fouled out with 4:16 left in the game and Rider up 99-83. Fouls were a major issue throughout the game, with a total of 53. The young Broncs struggled to slow the game down and run out the clock, turning the ball over on multiple failed alley-oop attempts. The Gaels never quit down the stretch, but dug themselves too deep a hole to climb out of. With 44.7 seconds remaining in the game, Baggett signaled for the Broncs’ lone senior to check in on Senior Day. Guard Joe Ajike entered the game to a standing ovation from the Alumni Gym crowd. With the team up by 20 for most of the second half, the crowd chanted “We want Joe. We want Joe.” Ajike made the team as a walk-on after previously serving as its manager for three years. The Gaels cut the lead down to eight in the game’s final seconds but the Broncs’ secured the 110-101 victory, after not trailing at all during the contest. On Feb. 22, Rider traveled to Monmouth for a meeting with the Hawks. The game was lost in the first few minutes as eighth-place Monmouth came out of the gates on fire. The Hawks shot 70 percent from the field in the first half and led 50-32 at halftime. The Broncs made a run late in the second half, but it wasn’t enough and Monmouth picked up the 91-77 victory. Sophomore guard Jordan Allen led Rider in scoring with 18 points on six three-pointers. Rider featured a league-high four players on All-MAAC teams this season. Vaughn made the All-MAAC First Team, averaging 16.1 ppg, 6.6 rebounds per game (rpg) and 1.8 steals per game (spg). Jordan made All-MAAC Second Team after leading the league in assists for the second year. Jordan averaged 12.7 ppg, six assists per game and 1.6 spg. Allen was named to the All-MAAC Third Team and the MAAC All-Rookie Team. Allen averaged 13.6 ppg and was named MAAC Rookie of the Week four times. Freshman forward Frederick Scott received All-MAAC Third Team honors as well, after averaging 13 ppg and 6.6 rpg. Scott hit the buzzer-beating three-pointer in the upset victory over Penn State on Dec. 22. Rider begins the MAAC Tournament on March 2, against the winner of the first-round game between Monmouth and St. Peter’s. The Broncs split the season series with Monmouth and won both games against St. Peter’s, but only by a total of seven points. In the semifinal round awaits the winner of the matchup between Iona and Manhattan. The Broncs won both hard-fought games against Manhattan this season and split the season series with the defending MAAC champion, Iona. A victory in the semifinal places Rider in the MAAC Championship, likely against the team it shared the regular-season championship with, Canisius. The teams split the season series, winning one-poiny on their respective home courts. The MAAC Championship will be on March 5 at 7 p.m. on ESPN2. Every other game of the tournament will be broadcast on ESPN3.